Workers and retirees are facing uncertainty about their retirement and have launched a campaign calling for the City of Regina and elected City Councillors to “Honour Our Deal“. 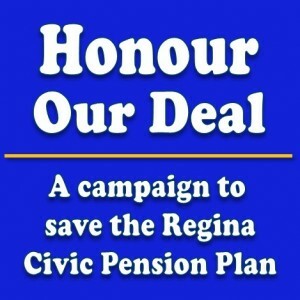 Take action: Don’t let the City of Regina walk away from our pension deal. Sign the petition to Regina’s City Councillors. Send an email to the Superintendent of Pensions at reginapension@gov.sk.ca urging that the May 2013 deal be honoured and implemented. Attend the upcoming town hall on September 8, 2014. The Regina Civic Employees’ Pension Plan has 4,000 active members and more than 2,000 pensioners which covers 21 employee groups and 5 employers – the City of Regina, some Regina Qu’Appelle Health Region employees at the Regina General Hospital, non-teaching staff at the Regina Public School Division, the Buffalo Pound Water Administration Board and the Regina Public Library.